When I go to print as a Viewer, the screen says processing, but the new window with the page to print never shows up. The Remote Utilities Printer is installed. This only happens when I am opening up a document that is on the host computer - the printing works when I open up a document on the viewer computer. Please, close/exit the Viewer and run it "As administrator" . Let me know if that works. Not sure how to open viewer as administrator. 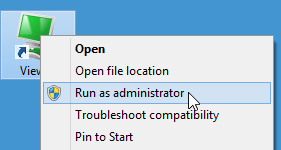 You should right-click on the Viewer's shortcut on your desktop and select "Run as administrator" from the Windows context menu. Ran as administrator. Same problem. Can print pages that i open on my computer - but if I open a file on the host computer, when I go to print, it just says "processing", but never goes to the window that shows the page to print. Please reply ... this is a serious problem for me. Sorry for the late reply. Could you please check Settings for Host -> Security -> Advanced -> Modes tab and make sure that you have "Remote Printing" enabled there. Remote printing is checked enabled. Again, I am able to print anything in my files, or off the internet. It is only a file that is stored on the host computer that is the problem. One more question - what RU version do you have installed? Is it the latest 6.3.0.6 on both sides (Viewer and Host)? Both settings are 6.3.0.6 - viewer and host.